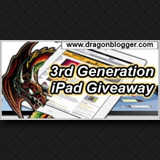 Justin, from Dragonblogger.com, is hosting yet another awesome giveaway. Previously he hosted the Kindle Fire giveaway and now he returns with the one product that everyone wishes to own, the all new iPad 3rd generation tablet. With the great retina display with 2048×1536 resolution, the A5X quad core processor, 5MP camera having a 1080P video recording and Bluetooth, who wouldn’t want this awesome piece ? In order to participate to win this tablet, complete the following entries given below. The more entries you have, the more chance of winning but all the names will be selected randomly. The contest is open to all international and national (US) residents but if the lucky winner is living outside the US, s/he would have to pay the shipping fees. Awesome post. It is very interesting information. Thanks for sharing. I would love to win this! I just saw the new iPad in the apple store yesterday and love the retina graphics. If I win, I will use this to write. Thanks for the giveaway! Best of luck Lisa ! The retina display is what makes the iPad so spicy! Thanks for the great information about new iPad 3rd Generation. It's more like: what would my wife do with it? She's been wanting something so she doesn't have to go upstairs to browse Facebook and so forth. Best of Luck Mark ! 🙂 Of course, the iPad would make things much easier! Wow, Awesome News about New iPad 3rd Generation.Thanks for sharing good post. Thanks for co-hosting the contest, don't forget to push your link as hard as possible so people join from your site, if you host the winning entry you win $50 cash. You're Welcome Justin! 🙂 Thanks for giving us the opportunity to host this giveaway too ! Fingers crossed ! Good Luck to everyone !